Virginia Gov. Ralph Northam spent the weekend responding to–and shifting his stance on– a racist photo that surfaced from his medical school yearbook. Meanwhile, a number of high profile Democrats and Republicans are calling on him to step down. We discuss the issues and get the latest developments. JONATHAN CAPEHARTYou're tuned in to The Kojo Nnamdi Show. I'm Jonathan Capehart of the Washington Post and MSNBC sitting in for Kojo. It's been a crazy few days in Richmond. Pressure has been mounting on Virginia Governor Ralph Northam to resign over a racist photo in his medical school yearbook from 1984. It seems his refusal over the weekend has made the situation that much worse. And as of airtime we do not yet have confirmation that the governor is stepping down. JONATHAN CAPEHARTSo as you all know and I'm sure you've all been talking about, the situation involving Governor Ralph Northam and there's no better person to talk to right now than my Washington Post colleague, Greg Schneider, who covers Virginia for the Washington Post in the Richmond bureau. Greg, thank you very much for being on The Kojo Nnamdi Show. GREG SCHNEIDERHey, Jonathan. It's good to be here. CAPEHARTAll right. Since you are down there and you are covering this story, Greg, what's the latest? What are you hearing down in Richmond? SCHNEIDERWell, it's become a little chaotic around the state capitol this morning,+ because this is about the busiest day for the legislature. Crossover is tomorrow and each house has to finish all of its bills and each chamber is now plowing through just dozens if not hundreds of bills all the while all this chaos and melodrama is circulating around and people are exchanging rumors. SCHNEIDERAnd so the governor has been meeting with cabinet members this morning, from what I understand that was a long schedule even routine meeting, but made, you know, unusual because of the circumstances and that he was going to directly address all the concerns and the situation with his cabinet. And I think some sort of meeting is still going on. It may have broadened beyond the cabinet at this point to other staffers in the administration, not a lot of information coming out. SCHNEIDERHe is said to be considering everything. I think after that initial defiance on Saturday, I think he's had some time for reflection. You know, the calls for resignation have just only gotten stronger. And everyone who he might count on for support almost has publically come out and said that he should step down. And I think he's very seriously considering that. CAPEHARTWell, Greg, I'm glad you brought up the fact that the calls for his resignation have been a torrent. And Friday night as you pointed out, he denied that he was in the photo, but then by Saturday he said that it wasn't him. Can you give us an overview? What happened in those intervening hours between Friday and Saturday? And then in terms of Richmond and the governor's administration how have the thunderous calls of resignation both within Richmond and around the country of senior Democrats, how much of that has played into the governor's thoughts right now? SCHNEIDERWell, sure. Here's what we're hearing about how that played out. And that's that on Friday night when this first began happening that Northam looked at the picture and the page with his name over it and basically -- and someone put it this way had brain freeze. And couldn't reconcile why that picture was under his name and in the moment pinned, you know, to respond to people in his orbit, who were suddenly asking for an explanation, took responsibility for it. And this is coming from people close to the governor. SCHNEIDERSo that's their version of what happened. That his first instinct being confused about what it could be seeing his name there, took responsibility for it. But then as the dust settled a little bit and he had time to think about it decided and look at it, decided that it truly wasn't him. SCHNEIDERAnd, you know, some people have said, you know, it's like a false confession in a murder investigation. That you don't know why people under pressure will say what they say. But supposedly, you know, that's the version of why he first said he was in it and then after thinking about it and looking at it and reaching out to former classmates from Eastern Virginia Medical School realized that, well, no, it actually wasn't him. SCHNEIDERAnd so that's when he decided -- and now here we get into a little armchair psycho analyzing. You know, as he's cited already now as this has played out, Northam was the President of the Honor Court at VMI. And I know from the time that I've been covering him and watching him in the campaign, you know, as goofy as it may sound, he takes that very seriously. That's a key part of his background and makeup. And so this idea of honor I think is important to him. SCHNEIDERThat may be or may have initially crowded out consideration of, you know, any broader questions about what might be best for the commonwealth or what other people around him are saying, he was focused on this idea of personal honor. And if he truly believed that he was not in the picture, then that sense of personal honor didn't allow him to take the fall for something that he didn't think he did. That's what people close to him are saying about why it went through that tortured, you know, sort of flip in the public space about first saying, "I'm sorry I did it." And then saying, "I didn't do it," which, you know, just looked very perplexing from the outside. CAPEHARTWe're going to get into the other issue involving that photo and that press conference, which is he said it wasn't him. But then he talked about a party he went to the same year where he did dress in black face to dress as Michael Jackson. And we'll be talking to Sasha-Ann Simons about that in a moment. But, Greg, I want to ask you about the publication that broke this story in the first place, Big League Politics. What is Big League Politics and how did they land this story? SCHNEIDERWell, they are a very active conservative leaning website with -- some of the backers behind it had ties to the Cory Stewart campaign last year. And have been, you know, pressing hard on some of the characters in Virginia politics. From what it appears, you know, if we can remember as far back as the middle of last week, which seems like a year ago now, what Virginia was caught up in then was a controversy about abortion and about some comments that Governor Northam made defending a bill that a Democratic delegate had introduced that had to do with loosening restrictions on late term abortions. And when Northam defended that bill in a radio interview last week, he used some language that, you know, charitably could be described as a little unclear. SCHNEIDERHe seemed to be describing what happens when you have, you know, a terrible situation of a baby that's being born and has, you know, flaws that won't be survivable. I don't know what the medical term is. But, you know, a grave health situation for the baby. And that, you know, if the decision is made to go ahead and deliver, then you have this baby that, you know, the doctors and the parents then have to talk about what's the outlook and the prognosis. SCHNEIDERBut he talked about in a way that opponents used to say he was in favor of infanticide, of basically killing live babies. And he did a poor job of trying to clear that up and explain what he meant. I mean he's a pediatric neurologist. I don't think anyone, even his opponents would ever have believed that he would favor killing live babies. But that's the way it played and his words left the door open for that. SCHNEIDERSo in that hubbub apparently someone, who'd been with him at Eastern Virginia Medical School was disturbed at, you know, that he would take that position and surfaced this photo to the website, Big League Politics. And that's how it came to light on Friday late. CAPEHARTI'm speaking with Greg Schneider of the Washington Post. He covers Richmond in the Washington Post bureau in Richmond, Virginia. I'm going to take a call from Sue in Reston, Virginia. Sue, thank you very much for calling into The Kojo Nnamdi Show. What's your view of the situation involving Governor Ralph Northam? SUEYes, hi. Thanks for taking my call. My opinion is I voted for Dr. Northam and I would vote for Dr. Northam again. I find it very disturbing that the Democratic Party would throw away, try to destroy the career of a good man for a photo from 34 years ago. And I have a problem with that and it's making me rethink my support for the Democratic Party. SUEI think it's very sad that we're trying to destroy his career over this 34 year old photo, when he's done such a good job as governor. He's done things that the previous Democratic governor couldn't achieve. And I truly believe that the photo in 2019 is irrelevant. I realize that it could be offensive to African Americans. I'm African American and I'm not willing to throw away this good man over this old picture. SUEAnd I really do believe that at Big League Politics and Mr. Cory Stewart, who's upset -- but the people of Virginia did not want him to represent us because of his Trump allied background. And while Mr. Trump is trying to shove Republicans down our throats and we clearly don't want them in this state. We -- I'm very disturbed and, boys, I think it's all going -- because these Big League Politics doesn't care about destroying our state. They just want to destroy the career of a good man over his abortion opinion, which is in my -- as woman, abortion is between a woman or her husband or partner and the doctor. It has nothing to do with other people. CAPEHARTAll right. 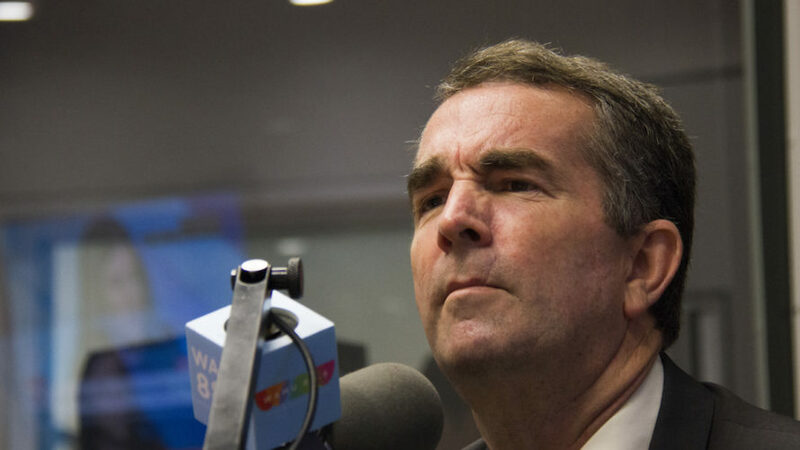 Sue, I want to thank you very much for calling in and sharing your thoughts with us about what's happening with Governor Ralph Northam and his medical school yearbook photo featuring a person in black face and another person in a KKK robe. I want to take one more call. This time, Mark calling in from Silver Spring, Maryland. Mark, thank you for calling into The Kojo Nnamdi Show. MARKQuickly three quick points, I think there could be thousands of pictures showing the governor saving lives while he was in the military, pediatric neurologist, and now with the passage of Medicaid expansion. The second point, what happened to the tenet of judging a person by the content of their character? This is not a governor, who condoned what happened in Charlottesville. This is not mob rule, vigilantism, what is? We should be deliberative before making decisions. Thank you for letting me say that. CAPEHARTMark from Silver Spring, Maryland, thank you very much for your three points there and being very concise. Greg Schneider of the Washington Post has been with us here since the beginning of the show and I know you have to go in a couple of minutes. But there's a second story out of Big League Politics, not new, but revealed over the weekend, Sexual assault allegations against the current Lieutenant Governor, Justin Fairfax and he's next in line after the governor. It's my understanding that our paper, The Post, looked into those allegations and declined to publish a story. What more can you tell us about these particular allegations? SCHNEIDERWell, Jonathan, I really can't say much about that subject, because I don't know much about it. That was handled by other reporters and editors at the Post. And we weren't involved in it here in the Richmond office. And I think a story is going up or is already up on our website that will explain what steps the Post took and what role there was in looking into that situation. And I just honestly don't know enough to say anything about it. I haven't been a part of that. CAPEHARTWell, I'm glad you pointed that out, Greg that the paper has put a story up on washingtonpost.com. If anyone is interested, they can take a look at the story and find out more about that. Greg, Justin Fairfax is the Lieutenant Governor of Virginia. He's the next in line to be governor. Assuming that the allegations are proven false against him, he becomes the next governor, could Justin Fairfax help repair some of the damage for Democrats -- the sense of betrayal many felt upon seeing that yearbook photo? What does he bring personally? SCHNEIDERWell, he's been a fairly late comer to state wide politics in Virginia. He ran for office before and was not elected. So this is his first public office being lieutenant governor. He won in 2017 at the same time that Ralph Northam did. He's already gained some notoriety, because he's the second African American elected to statewide office in Virginia. And on inauguration day last year his father came to him 20 minutes before he went out to be inaugurated and handed him a copy of the manumission papers for his great-great-great grandfather -- I think I've got that right. SCHNEIDERWho had been enslaved and was freed by one of the Fairfax family, a very prominent obviously northern Virginia families in something like 1798. And he hadn't known of his background, the specifics of it, and hadn't known that a document like that existed. SCHNEIDERAnd so it was a very profound moment for him to have that in his pocket when he took the oath of office as lieutenant governor. So there is, you know, a lot of feeling that there's some poetic, you know, justice to the idea that given the controversy that we're in right now that it would be an African American, who was able to take over the governor's chair and try to bring things together. But in terms of sheer political aspects of that question, he's a little bit less known. SCHNEIDERRalph Northam had been part of the legislature for something like a dozen years. And, you know, it's interesting to hear the callers. Northam has been a beloved figure in Richmond on both sides of the aisle. And so that's added to the weight of all that's happened over the past few days is first shock that someone, who had seemed to be, you know, a decent person would have something like this in their background -- might have something like this. SCHNEIDERAnd also a sense of betrayal that a lot of hope had been put in him as a figure who could be kind of a healing figure who was antidote to all of the ugliness that goes on in Washington and Virginians like to think that they're above that. They have this thing called the Virginia way that Northam talks about all the time. It could be that, you know, now Fairfax is the right person to define what the Virginia way is and carry that forward. But we don't know and, you know, this thing keeps taking crazy turns. So we'll just have to see. CAPEHARTAnd we'll be reading your report. Gregory Schneider, reporter covering Virginia for the Washington Post Richmond bureau. Thank you very much for being on The Kojo Nnamdi Show. CAPEHARTWe'll continue our conversation after a short break. Stay tuned. CAPEHARTWelcome back, I'm Jonathan Capehart in for Kojo Nnamdi. We're talking this time with Sasha-Ann Simons, the Race & Identity Reporter here at WAMU. And joining us will be Sarah McCammon. She's a national correspondent at NPR. Of course, we have been talking about the story of the day that's involving Virginia Governor Ralph Northam and the 1984 yearbook photo of a person in black face and another person in a KKK robe. CAPEHARTThere are lots of opinions and lots of strong feelings out there. Actually we got an email from Gloria in Ashburn and she writes, "While Governor Northam's medical school photo is upsetting and inexcusable, I think we need to treat the situation with some grace. The photo is from the 1980s and Virginia. The black face parties were very popular and I feel it's unfair to use today's yardstick. We have to also keep in mind that being outright racist in politics was okay until the 1990s." Sasha-Ann, give me your response to Gloria's comment. And also your perspective on what we've been talking about since Friday night. SASHA-ANN SIMONSYeah, absolutely, Jonathan. You know, Gloria's email, Sue's call a few moment ago, you know, thinking of the old classmates both black and white, who have all spoken up on behalf of the governor, you know, sort of defending him, defending the school, you know, despite multiple instances of black face showing up in that yearbook and KKK robes. You know, so that so far as we've seen isn't uncommon. SASHA-ANN SIMONSBut largely and you think about the 80 percent of black votes, you know, that the governor did receive in the election. That black support, you know, largely at this time there are feelings of pain being brought up again. And the idea, the thought behind it is, you know, the governor's refusal to step down is sort of a slap in the face. And many saying that, you know, what he's doing is really just avoiding the inevitable and he should resign and let the commonwealth heal from this. SASHA-ANN SIMONSYou know, there's been this increased popularity of quote black Halloween costumes and, you know, you see it in college campuses, universities. You know, students and professors doing these black face performances and each of the instances, sort of the same result. The people facing the scrutiny for the black face are coming out and they're saying, you know, "No. There was no racial hatred intended or, you know, no malice." SASHA-ANN SIMONSAnd we're seeing the same sort of thing play out here, but in politics, you know, where it's like, Oh, no, no. That wasn't me in the yearbook with black face. But that was me that other time, though, with black face. So neither situation is good, neither instance is positive. And when you're held in such a high position as governor of a state, a state with such a deep rooted racial history, yes, you're going to be measured by a different yardstick than most. CAPEHARTSarah McCammon of NPR, let me bring you in here. You were just at a press conference for the Virginia Legislative Black Caucus, what did you hear from legislators about Governor Northam's ruminations about his future? SARAH MCCAMMONActually, that press conference wound up being called off in part, because of all this. And what I was told was that it was a previously scheduled press conference. There is business to do right this week in the Virginia legislature with all this that's happening. The legislature's meeting, there are a lot of really big important deadlines to get bills from one chamber to the other, budget deadlines this week. So there's work that has to be done. SARAH MCCAMMONAnd the Black Caucus was going to give a press conference about a bill that they were backing and decided not to do that, I was told, you know, knowing that there are a lot of other pressing issues right this week now in light of everything that's happened. But my understanding is that that group has taken some time to confer and sort of tried to make sense of what's going on and look ahead to how they are going to get their business done this week in the legislature. You know, there's a lot of tumult obviously right now. And this has completely thrown a wrench into what was supposed to be already a very busy week. CAPEHARTWe have a tweet from Mike and he raises a very good point and once you hear this question, you will -- the picture that he is talking about will immediately come to mind. He asks, "How are this photo -- referring to the photo on Governor Northam's medical school yearbook page, and the photo of Mitch McConnell with a huge confederate flag different? Should not both men be treated the same way?" Sasha-Ann, it is an interesting question to ponder. SIMONSIt is an interesting question to ponder and that's sort of the point I was making before is that, you know, these are all in my view punishable events. And to take the Governor Northam situation a little bit further I think part of the reason too, you know, with these folks that are saying, you know, Why are we holding him to the standard? In this case, you have here a Virginia Democrat that was putting on black face. Yes, it was years ago, but he seemed to take it lightly, thinking of the press conference on the weekend. SIMONSThe jokes, you know, about the Michael Jackson costume and the instance where the reporter asked him if he could still moonwalk. And where he for a second pondered whether he should do it. CAPEHARTWhether he should do it. SIMONSAnd just looking to the left at his wife was like -- Okay, never mind. You know, so it just seems like it's being taken lightly and not as seriously as it should be. But, you know, going back before that 1984 yearbook, 1981. What about the racist nickname that was underneath his photo in his college yearbook where he was referred to as "Coonman" and he has admitted that that that was his nickname. But says he doesn't know why that was his nickname. How do you not know why your friends had a racist nickname for you? So, these are sort of the layered issues one on top of the other that make this so inexcusable. CAPEHARTSarah, let me ask you a question that I don't know if you're comfortable answering. It's jumping off something Sasha-Ann said earlier in our conversation. And that is the fact that Governor Northam won more than 80 percent of the African American vote. And that a lot of people point to African American voters particularly African American women as the people who put him over the top. And I'm just wondering in these conversations what duty does the governor have to that particular constituency in dealing with this situation? MCCAMMONI asked him something close to that during the press conference. I asked him, pointing out that the Black Caucus -- the Congressional Black Caucus, the Black Caucus here in Virginia, and a lot of other black leaders and a lot of other Democratic leaders, in general, as we know -- have all called for him to resign. You know, he said in the press conference that Sasha-Ann was referring to, he said that resigning would be the easier path, and that it wouldn't allow an important conversation to go forward. MCCAMMONBut I said, Governor, that's the path that these groups have asked you to take. Why not take it out of respect for them? And he said, essentially, you know, I'm going to keep talking to them. And I said, well, if you keep talking to them, this is still what they want -- which it is still what they want, according to their latest statements. I said, would you then resign? And he said, you know, essentially, he would think about it. And so, I think that the Black Caucus and other groups, NAACP, which is also nationally here in Virginia, called for his resignation. There are very critical voices, of course, in this conversation. They’re personally hurt by this. A lot of the people I’ve talked to find this very personally hurtful, and it’s also hurtful on sort of a relational level. These are people that have considered him a friend and an ally. He visited a black church yesterday and spent quite a bit of time talking afterward with both the pastor and several churchgoers. And a lot of folks were expressing that same feeling, that this is someone that we really trusted, that most of us voted for. And there’s a real sense of betrayal that I’m hearing from a lot of people. So, I don’t know how he can ignore that, especially when you consider that these voters have been such an important part of his base, as you point out. CAPEHARTLet me bring in Jack Wilson. Jack Wilson is the Chairman of the Virginia Republican Party. Thank you very much for joining us on the Kojo Nnamdi Show. JACK WILSONYes. Glad to be here. CAPEHARTSo, as I said in the introduction, there’s very little daylight between Republicans and Democrats in response to this yearbook photo. But tell us a little about how the Virginia GOP has reacted, and your own take on the governor’s public statements over the weekend. WILSONWell, when the story first started breaking on Friday, I said that we need to be very cautious. I’m somewhat surprised that the governor who had run for the State Senate before, who had run statewide for lieutenant governor, had run in a primary for his nomination for governor, and then obviously in the general election for governor, how something like this had not come out prior to Friday in connection with one of those election contests. And so, our initial statement, I think, was sort of a prudent one, which basically said, obviously, the photograph itself is abhorrent. Racism has no place in Virginia politics today. It never did, but unfortunately, in the past, we have that history. But it has no place in Virginia politics today. And if the governor is in the photograph, he needs to resign. WILSONSo, we gave that opportunity to see, perhaps, perhaps this isn’t all that it looks like it is. It’s obviously his yearbook page, but -- and then Friday night, when he admits in a public apology both in a written statement and then in a videotaped statement, admitting that it was him and apologizing, obviously, for the hurt that it causes, we felt -- as apparently every other national Democrat and every Democrat in Virginia -- pretty much said he needs to resign. Then you get to the press conference on Saturday, which I listened to. And, frankly, I found that pretty incredible. For somebody to have slept on it overnight, and then realized he wasn’t in the picture, seemed beyond credible. Frankly, I told some folks if somebody had come to me and said, you know, “Mr. Chairman, there’s a photograph circulating around that purports you to be in blackface or KKK garb. Is it you?” I could’ve immediately said, no, it’s not me, in about 30 seconds, and said put out a denial. WILSONFor the governor to wait that long and then admit that it was him, and then to turn around and try to say it isn’t him, I think he’s lost a lot of credibility on that issue. Clearly, it’s a sad time in the Commonwealth. I feel sorry for the governor and his family, and more important, what’s happening in Virginia because of it. CAPEHARTWell, Chairman Wilson, let me ask you this question, because I've got to get it out of the way. Were people connected to the Virginia GOP responsible for sharing this photo? WILSONAbsolutely not. I mean, again I was surprised by it as anybody was when it first came out. We saw it, and again, tried to take a cautious approach to it, because frankly, I didn’t believe it to be true, initially. And then it was, of course, verified through other news outlets. In fact, the yearbook photo page was accurate. That’s when we made the statement that we made. Again, given the possibility that the governor himself was not either in blackface or KKK garb. CAPEHARTSo, Chairman Wilson, your party made a swift response to the blackface photo, tweeting out, quote, “Given his” -- meaning Governor Northam’s -- “statements on the right to life, coupled with the most recent revelations, he has lost the moral authority to continue to govern and should resign immediately.” Republicans are clearly aiming to tie the two issues together. Greg Schneider talked about the abortion part of this earlier in the show, and it’s my understanding the president’s state of the union will focus on abortion. Why is that issue at the top of the Republican agenda right now? WILSONWell, frankly, the right to life issue has always been at the top of the Republican agenda, so this isn’t something new. I think what caught the Virginia GOP and obviously national Republicans by surprise was how far to the left the Democrat party in Virginia was willing to go on abortion. Following what had been passed in New York, it seemed a real shock that, in Virginia, Democrats would pursue that radical of an abortion agenda. To lessen significantly the restrictions on late term, third trimester abortions just seemed to be far out of the mainstream for even the Virginia Democrat party. And so, it’s always been a concern of Republicans. Obviously, our party is based partly on the right to life, but when you have a Democrat delegate introducing a bill and, in committee, basically saying her bill would allow a baby to be aborted seconds before birth, and then the comments that the governor made shortly thereafter, it just seemed that that position had gone far, far to the left in Virginia, and we weren’t going to tolerate it. CAPEHARTNow, Chairman Wilson, the Virginia Republican Party has had its share of accusations of racism in light of the candidacy of Prince William County Board of County Supervisors Chair Corey Stewart, both in the 2017 gubernatorial Republican primaries and last year’s Senate race. How has your party been dealing with the fallout from both elections that Corey Stewart ran in? WILSONWell, clearly, we, you know, had concerns. There were a lot of Republicans who did not support Corey Stewart. We, as a party, if there was ever a statement that was made -- and, again, I was only elected chairman in September of 2018, so I don’t know exactly all the comments and statements that were made by my predecessors. But clearly, any racist statements, any racist comments would’ve been quickly condemned. And I, as chairman of the Republican Party of Virginia, will not tolerate it from any candidate, whether it’s Republican or Democrat. It’s just unacceptable. And I will call it out whenever I see it. CAPEHARTWell, that’s a good segue to a question I was going to ask you, to respond an op-ed piece by Tom Nichols that was in the Washington Post. He wrote an op-ed that echoed what many Democrats have been saying, which is that Republicans can’t call out Northam for racism, but give President Trump a pass. How do you respond to that? WILSONWell, frankly, I’m not so sure when you look at President Trump -- prior to being elected, President Trump was, I believe, awarded several awards from the NAACP, recognized in the black community for the work that he had done. So, when he became a Republican candidate for president, and then president, that the accusations started. And when you get to the president, I look at his results. Sometimes his rhetoric might be a little hotter than I would prefer, but I look to the results of the president. And you start looking on the economic side, the record-low unemployment in the black community, as well as Hispanic community. But then you go beyond that to things like criminal justice reform that has a major impact on the minority community. Those are things that are results that benefit minority communities around the country. And so, clearly, the president has concerns about illegal immigration. That isn’t necessarily a racist position, although there are those on the left that would like to paint it as such. He was painted as anti-Muslim, when, in fact, he was basically talking about the national security of the United States and recognizing that many of the terrorist that come to the country came from some of these predominantly Muslim countries. WILSONAnd so a lot of the president’s accusers, I think, are playing more politics than actual concerns about race. He clearly was a favorite of the NAACP before he was elected, and that changed only after he got elected. CAPEHARTChairman Wilson, if we had more time I would have you stay on and we could talk about Charlottesville, the Central Park Five and a whole lot of other instances, but I do want to thank you very much for being on the Kojo Nnamdi Show. You were just listening to Jack Wilson, who is the Chairman of the Virginia Republican Party. You are listening to the Kojo Nnamdi Show. I’m Jonathan Capehart. We’ll continue our conversation about Governor Ralph Northam and that yearbook page in a moment. Stay with us. CAPEHARTI’m Jonathan Capehart of the Washington Post and MSNBC, sitting in for Kojo Nnamdi. I’m talking with Sarah McCammon, national correspondent at NPR, and Sasha-Ann Simons, race and identity reporter here at WAMU. We are talking about the story that everybody’s been talking about since Friday night, and that is Virginia Governor Ralph Northam’s 1984 medical school yearbook page that featured a photo of one person in blackface and another person in KKK garb. Our phone lines have been lit up. I want to go to Alex, who’s calling in from Fairfax, Virginia. Alex, thank you very much for calling in to the Kojo Nnamdi Show. ALEXHi. Thanks for taking my call. CAPEHARTSo, what’s your view of all this? ALEXSo, I actually have a question about historical context, which I feel like is really important about issues like this, especially, I don’t know, the world has just accelerated a lot in the past century. So, I was born in 1990. I wasn’t around in the '80s, but I did go to grade school and college here in Virginia. I’ve lived in northern Virginia for the past eight years or so. And just thinking about what you said about these blackface parties being popular as something that people, like, went to and did in the '80s, and comparing that to the kinds of parties that I went to in parties and the kinds of social engagements that I attend now, it’s, like, can you guys help me understand how that was a popular thing that didn’t skeeve people out? How did, how did that not weird people out back then? I just -- can you guys help me? SIMONSWell, it did. It did weird people out, and that’s what I was saying. And I wasn’t saying that it was just the 80s. It was even well before that. And so, the idea, you know, of the governor, you know, acting as though -- and other people who have done this, as well, acting as though, you know, Klan hoods and blackface were these common sights and no big deal in a time like 1984 when, you know, thinking of 1984 Virginia. And the fact that he was a grown man at that time. He was a man. He was an adult, in medical school, not, you know, a teenager or anything. You know, that’s just not the case. You know, a person should’ve known better. There was such heightened racial awareness back then. I mean, 1984, you know, Reverend Jesse Jackson was running for president at the time, and it was not a time where that would’ve been acceptable, and it still is not acceptable now. MCCAMMONYeah, I had a similar question to the caller. I, myself, in ’84, was a toddler in the Midwest, so I don’t have much context myself, either. But I asked this question of a couple of Southerners I know in their, you know, later 40s, including one right here in Richmond, and they said the same thing. No, this wasn’t a thing. This was not something that was part of the culture. It around. I asked one black man and one black man who both grew up in the South, and they said essentially the same thing. And a woman at the black church I visited yesterday morning, you know, she was really wrestling with how to feel about all of this, because she had been a fan of Northam, she told me. But she said, look, this was 1984. Yeah, it was 30-something years ago, but it was, you know, well after the civil rights movement. This kind of thing was unacceptable then, and it’s unacceptable now. SIMONSIn the black community, we would literally do a collective sigh every time one of these instances would come out, and we still do. You know, you hear about, you know, another college campus, another instance of blackface. It’s like, oh, again? We haven’t learned? CAPEHARTRight. And those are recent incidences that we’re talking about. I should also point out that we got a tweet from thurberteam, who says, “No, it was not common to wear blackface in 1984.” She goes on to refer to guests who were on “Meet the Press” on Sunday who also disputed Governor Northam’s comment that it was common. And I just want to point out, with all these people born in the '80s, I suddenly feel extremely, extremely old. Let’s go to Joe in Rockville, Maryland. Joe, thank you very much for calling into the Kojo Nnamdi Show. JOEYeah. Thank you. I think we have to step back and look at what type of standard is being set here for people in public office. And I think us on the left and Democrats, we are setting such an impossible standard, that anytime somebody offends somebody or does something stupid or racist or whatever, even if it’s 30 years ago, that person immediately has to be destroyed, and that’s the end of the story. Now, I didn’t like it when, you know, maybe politically, you would try to get Kavanaugh with the same thing. My goodness, we went to that guy’s, you know, yearbook and took the words boofing, whatever it meant 30 years ago, and did that. We just tried to destroy that guy’s life. Now, Northam is getting destroyed. And I hate to say this, but we on the left are -- have developed this our own self. He has to resign, or else he and liberals or just an unbelievable, raging hypocrites, just like, unfortunately, the lieutenant governor. He should either resign, or he should say he’s not going to take over as governor until these allegations come out. Yes, they haven’t been proven, but the standard that the left has ridiculously set has made it we believe a woman if it’s been accused. Okay, somebody’s been accused. We've got to believe her. Now the burden’s on Fairfax? That’s ridiculous. And we shouldn’t do it to the conservatives. We shouldn’t do it to Republicans, and we shouldn’t do it to ourselves. And we shouldn’t see racism and sexism and every type of ism every time there’s a little affront. It is ridiculous. No wonder Trump won on some of this political correct stuff. And, yes, blackface is bad. Blackface is racist. Not defending it. But we have to step back and look. People, let’s just get sane. CAPEHARTAll right, Joe, thank you very much. Joe was calling in from Rockville, Maryland, making some interesting points. I want to point out one thing, that the allegations against Lieutenant Governor Justin Fairfax have not been substantiated, and the Washington Post looked into them a year ago and did not go with the story on that. I’m sure we will hear more about that in the days ahead. But one thing we haven’t really talked about, Sasha-Ann and Sara, is the issue of Charlottesville, and how Charlottesville hangs over this story in a way that I don’t think is given much attention. You had Charlottesville. You had the gubernatorial campaign that the Republican challenger Ed Gillespie ran, and that now Governor Northam ran against to try to be a unifying figure. One of you, jump up and take this Charlottesville angle, here. SIMONSYeah, I mean, that demonstration by -- I’ll just start by saying that demonstration in 2017, you know, by white supremacists in Charlottesville, you know, leading to a deadly riot. You know, I’ve said it before and I’ll say it again, that itself was just a symptom of a much larger problem in the state of Virginia. You know, Virginia, you know, was the home, you know, the capital of the Confederacy. And you know, slave -- built upon centuries and centuries of slaves, this year being the 400th anniversary of the first arrival of enslaved African Americans in Hampton Roads Harbor, Virginia, you know. So, that sort of overshadows -- looking at that picture of Charlottesville just goes to show you the deep-rooted racial issues that are lying in the state of Virginia. And, in this case, it shows you that Republicans and Democrats are exhibiting these types of questionable practices, you know. CAPEHARTWell, we have to remember, the Democratic Party that we know today is not the Democratic Party that it was even in the '60s. There is a lot of sort of party-swapping that happened after the civil rights movement in the 1960s. Sarah, what’s your thoughts on Charlottesville? MCCAMMONRight. Well, I think it’s important to note that, yeah, there are a lot of sort of clouds related to racism that have been hanging over this state for the past couple of years. Charlottesville, of course, was a horrific incident. Right after that, then Governor Terry McAuliffe, you know, went to a black church the morning after in Charlottesville and tried to sort of bring unity. And I can’t recall if Northam was with him or not, but, you know, that was part of his role as lieutenant governor then was, along with Governor McAuliffe at the time, was to try to sort of bring comfort, you know, after this horrific, painful incident. And then, you know, we’ve had the ongoing debate in this state about Confederate monuments, whether they should stay or go or be reinterpreted. And that was something that came up in the governor’s race. It was an issue that Ed Gillespie, the Republican, and Northam, of course, the Republican differed on. Northam, I believe, supported removing Confederate monuments. MCCAMMONAnd, you know, privately, I’ve heard a little bit of crowing from Republicans who felt that Gillespie was sort of painted unfairly because of some of those issues and his positions on immigration. They felt he was unfairly painted as a racist by Northam’s campaign. Seeing this sort of come back around, I think, you know, they’re definitely maybe feeling a little bit of -- I don’t want to say glee, but it just goes to show that these issues are still very much on people’s minds. And, certainly, in the wake of Charlottesville, even more so. SIMONSWhat I mentioned earlier, with, you know, his wife saying, you know, like, “Not now, honey,” basically. Inappropriate circumstances. You know, he needed to be told. He had a black aide that told him prior that that was wrong. And just even in the moment, you know, trying to lighten the moment, had to be told that that was wrong. And I think, also, let’s remember that like we’re talking about this med school yearbook. These are future doctors that we’re talking about, as well. And so, it’s highly, you know, critical, you know, when you think of, you know, these people who could be in charge of taking care of black mothers and, you know, black babies or black men dealing with medical conditions. And so that adds another piece to it that is troubling. CAPEHARTMm-hmm. Yeah. We have a call here. We don’t have enough time to take it. Keith, calling from Washington, DC, if you’re listening, my apologies for not taking your call, but I’m going to throw out what you were going to say. And that is the issue you’re bringing up, Sasha-Ann, about the fact that these are doctors, and whether did any of this affect his ability or his helping minorities. CAPEHARTI mean, this -- I know there are some people who might think that that’s not, you know, we’re going way too down the road here with that kind of question. SIMONSBut it’s something to think about. It’s potentially terrifying. And there’s been a lot of reporting that I know in the Post and here at WAMU about what’s happening with black mothers and black babies and infant mortality rates in the African American community and things like that, of that nature. So, yes, it may be a loose connection, but, I mean, yes, these are future doctors that were, you know, portraying racist acts. MCCAMMONAnd that’s one thing I heard from a young student, a nursing student who was attending the NAACP meeting here this weekend. Same concern. She said, you know, how are doctors supposed to treat patients of color equally, if they’re doing things like this? And as Sasha-Ann points out, there are significant health disparities, and they fall along racial lines, right. So, it’s a real concern. CAPEHARTReal quickly in the less than 30 seconds that we have left, Sasha-Ann, what are you keeping your eye on, as this story moves forward? SIMONSAs this story moves forward, my eyes are on the lieutenant governor. You know, I just really -- aside from the allegations that we’re still waiting to hear more about and confirm, I know Sarah’s doing some work on that now. But just definitely wanting to see where he goes as he awaits this possible resignation. MCCAMMONYeah, well, certainly the lieutenant governor and just what do Democrats do moving forward, right. All of them have come out, virtually, to say that Northam needs to step down. If he doesn’t, what else can they do? Can they ratchet up the pressure in any way? CAPEHARTSarah McCammon and Sasha-Ann Simons, thank you very much for being here. That’s it of the show. Today’s segment on Governor Ralph Northam was produced by Mark Gunnery. Coming up tomorrow on the Kojo Nnamdi Show, the straw ban in the district and what it means for plastic pollution in our waterways. Plus, administrators at local charter schools earn some of the highest salaries in the industry, but teachers land at the other end of the scale. We’ll explore the issues. Thanks for listening. I’m Jonathan Capehart, in for Kojo Nnamdi.